It took quite a fight over many years, but Lake Macquarie now has the newest, the best and most effective police resources anywhere in regional NSW. I joined Police Minister Troy Grant and Lake Macquarie LAC Commander Brett Greentree at the official opening of the new Toronto station on June 7, signalling the last major milestone in a $30million project which delivered new stations at Toronto and Morisset, and a new LAC headquarters at Belmont. Without doubt, our local police were hampered by dreadful buildings and conditions before the current State Government stepped in and came up with the money for the modern and well-resourced stations we have now. Be assured, this area now has the best police units and the best police resources outside of Sydney. Most crime rates are well down, police numbers are good despite us always wanting more, and Superintendent Greentree and his charges should be applauded for that. There are always complaints from some quarters, and some I agree with, but it’s impossible to have police on every street corner, nor should we want them. I’d like to see the Morisset station opened on weekends and at nights, but police say that modern policing methods don’t require it because every police car is now a mobile station. I’d also have preferred to see the new Toronto station built on the site of the old RTA building, but the police preferred a purpose-built station on their existing site. But these decisions are made by the police. They are the experts. They are the ones in the front line who are bringing our crime rates down. We should back them, and we should thank them. MEMBER for Lake Macquarie Greg Piper didn’t pull any punches when describing how dilapidated the old Toronto police station had become. “It was really as bad as it could get without it being condemned,” Mr Piper said. Never mind the cracks in the walls, the flaking paint, and the furry critters who inhabited the roof cavities; the station built at the corner of Cary and Thorne streets in 1964 was no longer large enough nor functional. “The old station just had no utility for modern policing,” the Independent state MP said. There was no space for officers to relax and “have a cup of tea”, and when the police needed to have a meeting, they were forced to do so off site. 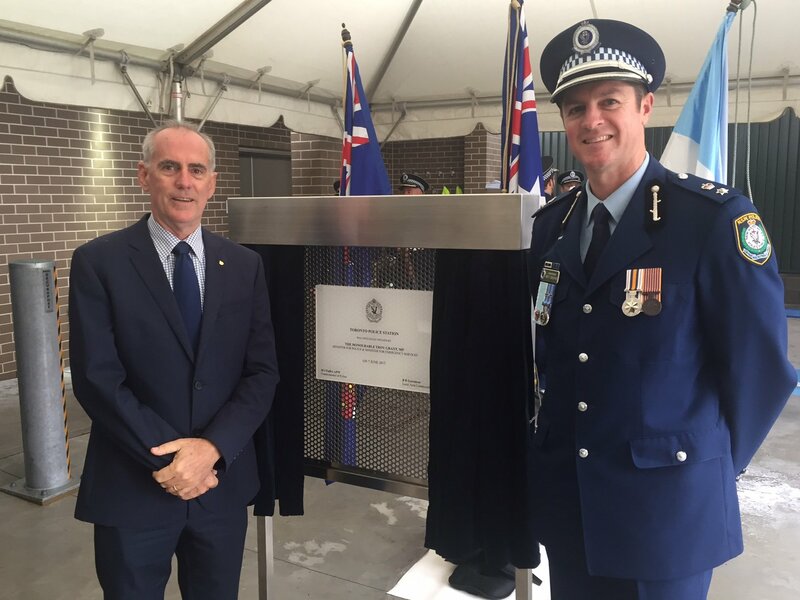 So, this morning, when Police Minister Troy Grant officially opened the new $6.8 million Toronto police station, Mr Piper understood better than most what it meant to the men and women in the Lake Macquarie Local Area Command. The opening was the culmination of more than a decade of lobbying by Mr Piper for better facilities for local police. “I started raising these issues even before I was the state member in 2007 because I’d dealt with police who I knew were working out of very, very sub-standard facilities,” he said. The Toronto building follows Belmont and Morisset to complete the trifecta of new police stations opened in Lake Macquarie in the last two years at a combined cost of $29 million. The new Toronto station incorporates a segregated charge room, a new meeting facility which allows briefings, task forces, and training to be conducted at the station, and an upgraded public waiting area with a television, toilet facilities and improved seating. Staffing at the station comprises a chief inspector, seven sergeants, a senior constable station officer, four leading senior constables, 36 general duty senior constables and constables, three police prosecutors, and three administrative support staff. Lake Macquarie Commander, Superintendent Brett Greentree, welcomed the improved facilities. “Policing in Toronto has a long history,” he said. “In 1905 we operated from a rented premise, before building a police boat shed in 1917 that was used as an extra building, before moving to the current site in 1964. In their speeches at the opening ceremony, Superintendent Greentree and Mr Grant acknowledged the role Mr Piper had played in helping to bring the Toronto station to fruition.